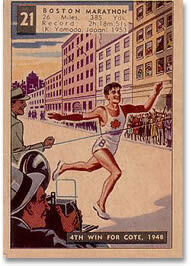 This card measures 2 1/2" x 3 5/8"
Tegla set the world record for the marathon at Rotterdam, running 2:20:47. 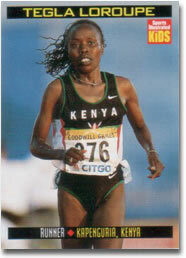 She has won the NYC Marathon twice, as well as winning the London, Berlin and Rome Marathons. 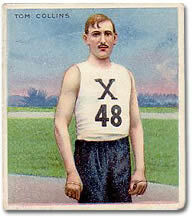 Collins competed for the Irish-American Athletic Club, running distance and cross country. 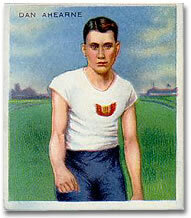 He won the Indoor National Championship 5 Miler in the world record time of 25min 19 2/5sec in 1908. 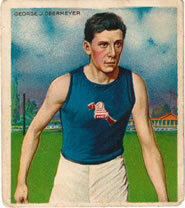 A distance man by trade, Obermeyer's bes6t distance was 5 miles but in 1909 he won a 12 miler and a marathon. 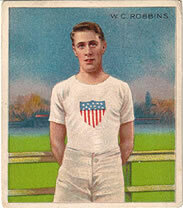 One of the top quarter-milers in the U.S., in 1909 he ran 48 4/5. 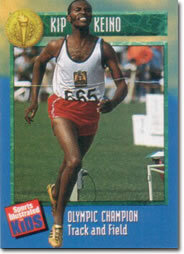 Many more running cards are available on our Sportscasters Cards Page. A cute 2-4 player game in very good condition. 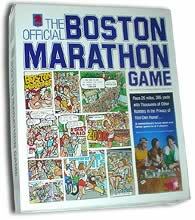 As the game box says, " Race 26 miles 385 yards with thousands of other runners in the privacy of your own home!" One corner of the box top had split and was repaired.